A review of: Canaan, Joyce E. and Wesley Shumar, eds. 2008. 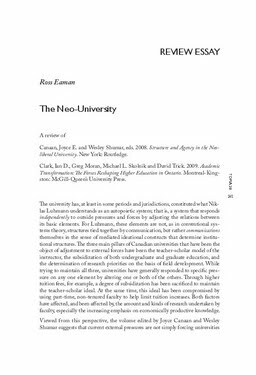 Structure and Agency in the Neoliberal University. New York: Routledge. Clark, Ian D., Greg Moran, Michael L. Skolnik and David Trick. 2009. Academic Transformation: The Forces Reshaping Higher Education in Ontario. Montreal-Kingston: McGill-Queen’s University Press. Eaman, R. (2012, November 7). The Neo-University. TOPIA.